Shameless self-promotion time. I have a new book coming out October 10'th, but in the crazy world of Supernatural Central, I don't even know if I have that date free to promote it. That's the way things go sometimes, best laid plans and all that. This Saturday is a bit of a harried day, so this is going to be short. Here's the book trailer that Corr Commercials did for me. They support indie writers, and if you want a reasonable priced trailer, give them a shout. I think they captured the essence of the book really well. The eBook is up for pre-sale at all the usual haunts. 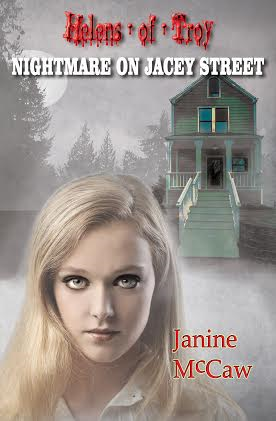 Nightmare on Jacey Street is the sequel to Helens-of-Troy. Helens is available on eBook format for free (the link is just to the right) if you`d like to catch up. It`s also available in paperback, but sorry I can`t make that free. It`s also free on Kobo for Canadian peeps. Or you can get it on #instaFreebie.